Cintron, Reading, PA, took control at the opening bell with his longer reach and deeper ring experience. Common opinion believed that Brunson needed to get busy early and press the action to allow for his punching power to dictate the bout. 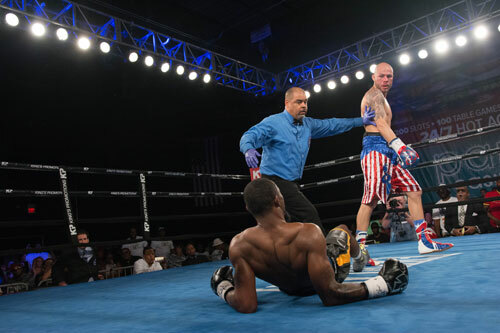 So when Cintron jumped out to a fast start and Brunson appeared to be in a boxing – and not punching – mood, the first three minutes looked like the evening would belong to Cintron. 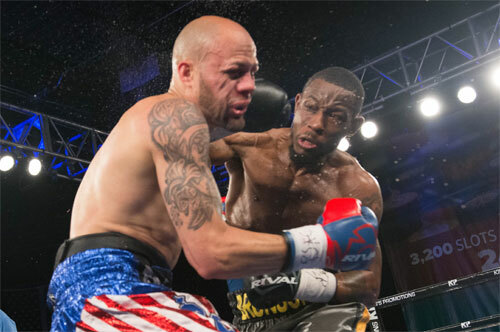 The former champ continued to set the pace in the second, but a hard left hook by Brunson midway through the round showed that the Philadelphian wasn’t dead yet. 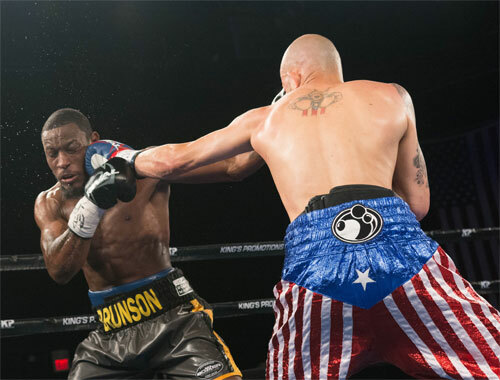 Still, Brunson’s effective output was sporadic and Cintron steadily built a lead. 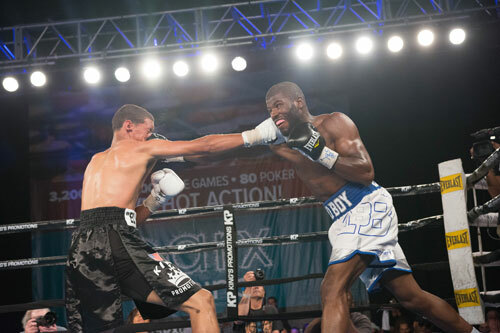 Cintron took the second and third rounds, while Brunson tried to get things going. 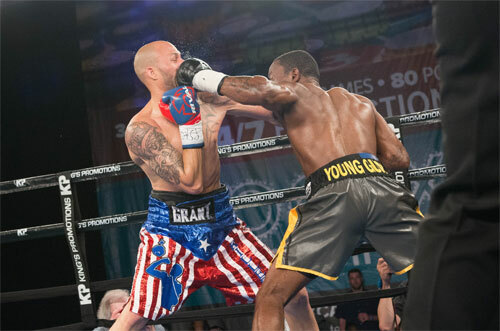 In round four, Cintron slammed Brunson with a left hook and Tyrone crashed to the canvas. He looked down at the mat for a moment as he collected himself. What must have been running through his mind? Brunson climbed up slowly and still looked shaky where he regained his feet. Once the action resumed, Cintron jumped right in and went for the kill. He caught Brunson with a hard right hand and added a left hook as Brunson folded onto the floor again. Once again, Brunson paused there on the mat. It would have been quite easy for him to take the count and give in to what now seemed like an impossible task. As Brunson struggled upward, it was all but certain that Cintron would soon close the show, forcing Brunson to find another line of work. This kill-or-be-killed was just about over. However, Brunson had been in this spot before. Only one year ago, he had to rise from two knockdowns against another opponent in the same arena before winning a fight. But Cintron was a closer. After all his nickname is “Killer”. Cintron came at him, but only had time for a few more punches before the bell ended the round. 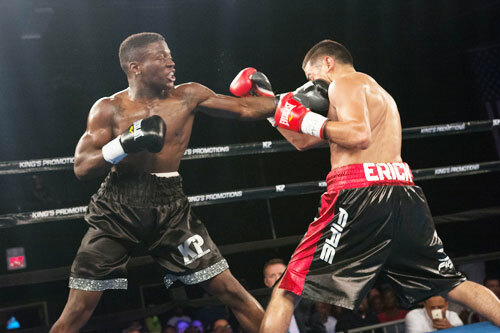 In round five, the fighters re-engaged at the opening bell, but by now, Brunson was fighting for his career. 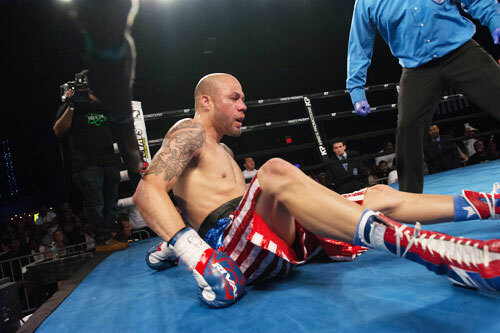 Suddenly, he launched a right hand that floored Cintron and detonated the crowd. Brunson’s lost cause had unexpectedly taken a drastic turn. The old pro that he is, Cintron rose from the knockdown, but Brunson was right there to meet him. He knew this opportunity might not last, and it was time to do what he does best. 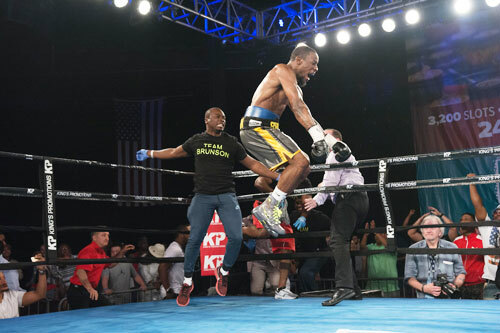 Brunson kept pressing and caught Cintron with another ramrod right hand that sent Kermit sprawling for a second time. After the mandatory eight-count by referee Shawn Clark, Cintron stepped back in, and Brunson overwhelmed him with an array of punches. Several shots landed and Cintron crumbled down to the mat for the third time. The moment he hit the floor, referee Clark waved the fight over, and Brunson exploded in celebration. 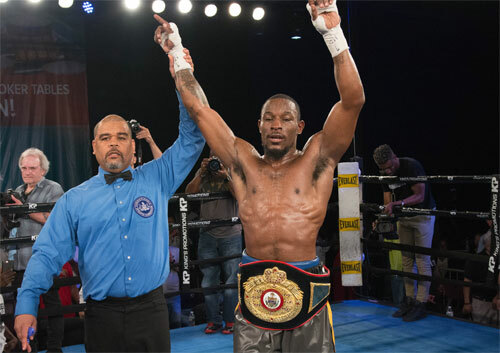 Brunson, 25-6-2, 23 KOs, had not only survived; he won the biggest victory of his career, and collected the PA state junior welterweight championship belt in the process. Entering the ring with a decent 50/50 shot of winning, the fight was still his to lose, and many thought he very well might find a way to do so. Perhaps knowing that his future prospects would be null if he lost to Cintron gave Brunson the extra drive needed to win on this difficult night. 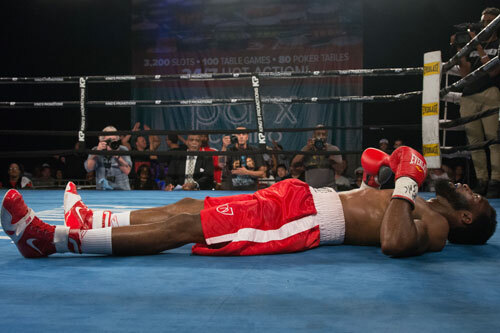 But it is more likely that Brunson’s heroics in round five came more from that gnawing desire to erase the suspicion and dismissal he’s received since the opening chapter of his pro boxing career. All those wins, all those knockouts, did nothing to build Tyrone’s reputation. In fact, they did just the opposite. But Tyrone Brunson is a fighter, a real fighter. He’s been doing his best to prove it all along. And his tremendous win against Cintron, 39-6-3, 30 KOs, was the best piece of evidence we’ve seen so far. Brunson, the winner of the Briscoe Award for KO of the Year for 2016, put himself in the running for more awards next year. This fight should contend for KO of the Year and well as Philly Fight of the Year for 2017. 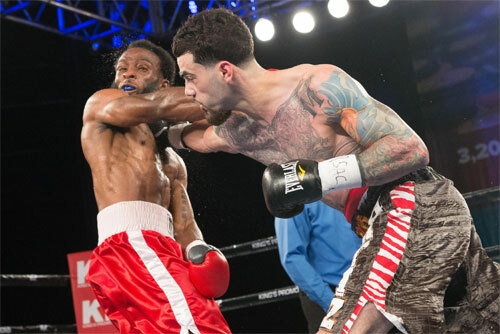 In the co-feature bout, Yonkers, New Yorker Victor Vasquez, 8-3, 3 KOs bludgeoned Philly's Anthony Burgin, 10-4, 2 KOs, for six rounds, en route to a unanimous decision. Burgin looked like a faded fighter from the opening round, and had a hard night in his fifteenth bout. After taking the first round, Vasquez dropped Burgin with a jarring right uppercut in round two. Burgin made it back to his feet, but he looked wobbly. He lasted to the bell and trudged back to his corner. It wouldn’t have been a shock if Burgin’s team had halted the contest between rounds, but they allowed to continue. Burgin absorbed a beating over the next two rounds, but remained on his feet. 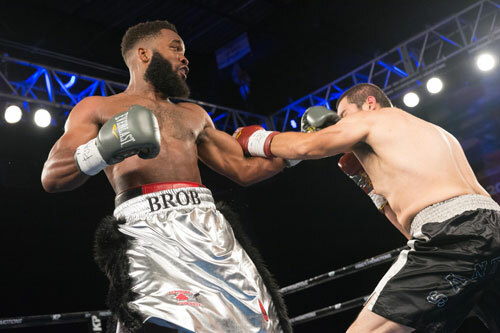 In round five, Burgin rallied to win the round and appeared to have shaken off the pounding he had received up to that point. 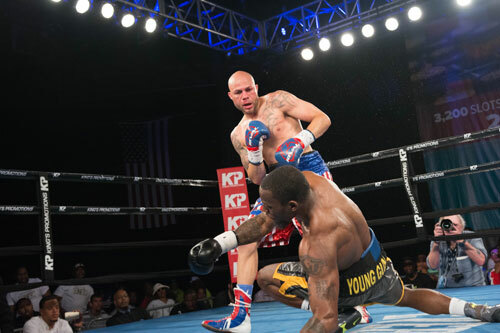 However, in round six, Vasquez was back on point and closed the show by taking the final round. All three judges scored the fight for Vasquez. David Braslow had the bout close, 57-56, while Steve Weisfeld and Lynn Carter favored Vasquez 58-55. Streaking Philly lightweight Steven Ortiz,7-0, 2 KOs, remained undefeated but hit a speed bump in Tyrome Jones of South Bend, IN. Yes, Ortiz won the fight, but this was his toughest test to date. Ortiz took the first two rounds and dropped Jones with a right hand in round three. However, Jones was full of fight, and came back every time he was hot. Despite piling up rounds, not everything went Ortiz’ way in the fight, and the young prospect repeatedly complained to the referee about Jones’ rough tactics. Mainly, Ortiz was feeling the growing pains of facing an opponent with a bit more experience than his previous foes. Jones nailed Ortiz many times, testing his chin and shorting him on the respect he’s used to getting. Round four was the best of the fight with both boxers landing often. Jones was winning the round, when during one heated exchange, Ortiz cracked Jones with another hard right, and once again he tumbled to the canvas. 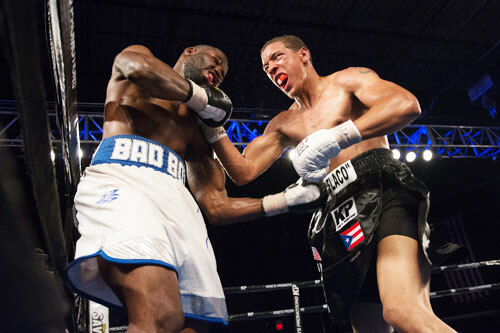 Ortiz was putting the fight away on the scorecards, but he continued to work for his victory until the final bell. My card gave Ortiz the first four rounds and Jones the final two. The official judges all had Ortiz in the lead after six full rounds. David Braslow had it 57-56, while Steve Weisfeld and Lindsey Page both scored it 59-33. 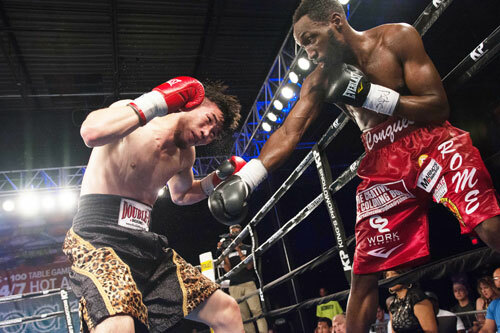 Philly lightweight Jerome Conquest, 8-2, 1 KO, came off the floor in round three to win a 6-round unanimous decision over Philly-based South Korean Jae Ho Kim, 6-4-1, 2 KOs. Jerome won the two opening rounds, but then ran into Kim’s stiff right in the third. The punch put Conquest back on to the seat of his pants. He bounced up but looked affected by the shot. However before long, he appeared fully recovered and went back to the business of winning the fight. Kim was competitive but Conquest swept the rest of the fight, and won by scores of 59-55 (Page), 58-55 (Carter), and 57-56 (Weisfeld). Despite the knockdown, this was perhaps Conquest’s strongest performance to date. 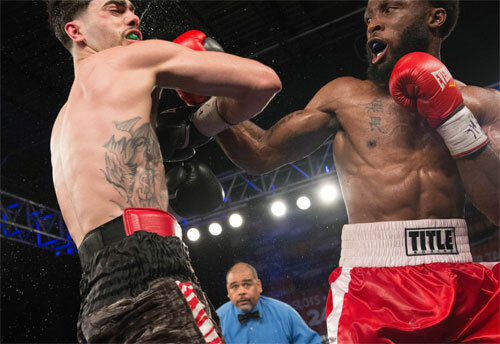 Upper Darby, PA super middleweight Brandon Robinson, 4-1, 3 KOs, stopped Rafael Valencia of Medford, OR, 3-8-1, 2 KOs, at 2:48 of round two. After being warned for a low blow in the second, Robinson nailed Valencia with a hard right and left hook that put him on the canvas. Valencia got up, but referee Shawn Clark stopped the contest. 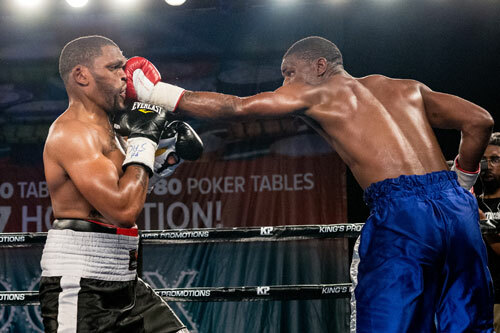 In another super middleweight bout, Gregory Clark of D.C., 3-1-1, 1 KO, blanked Asbury Park, NJ's Daryl Bunting, 3-2-2, 1 KO, on my card, and went on to win on the official cards by scores of 58-56 (Weisfeld) and 59-55 twice (Page and Braslow). 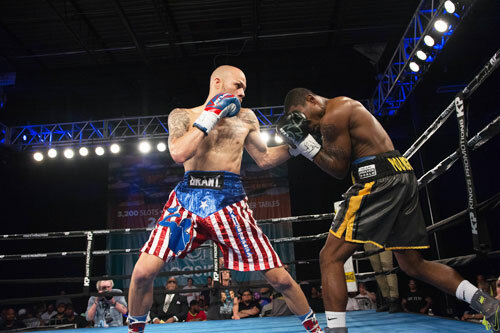 In a feisty, two-way bantamweight bout, DC's Marcus Bates, 7-0-1, 6 KOs, beat Mexican Roberto Pucheta, 10-12-1, 6 KOs, by unanimous decision over six entertaining rounds. In the first, Pucheta looked like a sure winner, hurting Bates three times. However, Bates turned the tables beginning in round two. He won the next four rounds, bloodying the Mexican’s nose in the third and putting him down with a left hook in the fifth. The more experienced Pucheta did enough to win the final round, but it was his first since the opening round. Bates took all three official tallies for the win, 59-54 (Weisfeld), and 58-55 (Braslow and Carter). 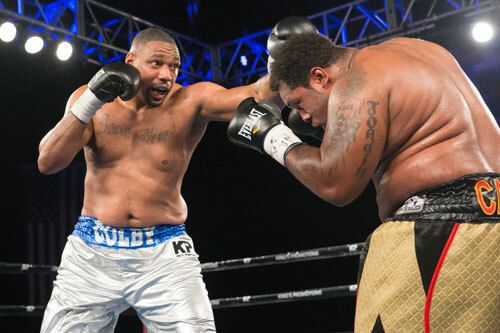 In a six-round heavyweight bout, Joel Caudle, Raleigh, NC, 7-0-1, 5 KOs, and Colby Madison, Owings Mills, MD, 4-0-1, 3 KOs, battled to a majority draw. Although the fight was close, I felt Caudle had done enough to edge the score. However, only one official judge had him in the lead, Lindsey Page, 58-56. Judges Lynn Carter and Steve Weisfeld both saw the fight a 57-57 deadlock. So the bout was declared a draw. 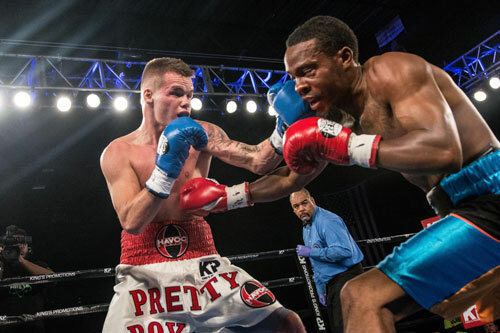 In the opening bout of the evening, featherweight Chaise Nelson, of Mansfield, OH, 6-1, 3 KOs, won a 4-round unanimous decision over DC's Jordan Peters, 2-1-1, 2 KOs. All three scores were 39-37 (Page, Carter and Braslow). A solid summer crowd of about 800 attended the nine-bout show by Kings Promotions. The company bounces right back Tuesday night in Bethlehem, PA with another good looking card, and returns to the 2300 Arena in August.